Florida Sea Grant has recently been awarded $308,206 from the Gulf of Mexico Research Initiative to help create a new science education program that disseminates key oil spill research results to industry and community audiences. The award is part of a larger $1.52 million project shared with other Sea Grant programs in the Gulf of Mexico. 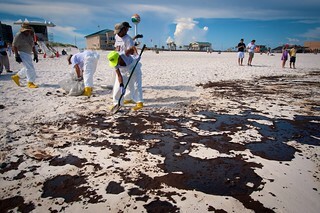 The monies will be used to hire four outreach educators, one in Florida and three in other Gulf states, who provide regional outreach in coastal communities affected by the 2010 Deepwater Horizon spill. The Gulf of Mexico Research Institute is an independent organization created in 2010 with $500 million that BP set aside over a 10-year period to investigate how petroleum pollution affects near-shore and deep-ocean habitats in the Gulf. Projects are conducted by universities across the U.S. The projects also focus on developing improved spill mitigation and remediation technologies. The Institute looked to the four Sea Grant programs in the Gulf region — Florida, Mississippi-Alabama, Louisiana and Texas — for assistance with raising awareness about research results with coastal industries and communities. Each educator will be based in a different state, but work regionally as a team. The Florida position will be based in the Panhandle community of Milton. The others will likely be based in Mobile, Ala.; Baton Rouge or the Louisiana coastal zone; and Corpus Christi, Texas. Educators will be hired who have expertise in an area such as physical oceanography, chemistry, biology or public health. New hires are expected to begin as soon as July 1. The team will conduct a number of workshops in coastal communities to share results of research projects, and produce oil-spill related publications and press reports. If all goes well between the Sea Grant programs and the Institute, the initial two-year contract can be renewed for up to 10 years.